The Blogger's Choice Awards, the most popular user-generated blog voting site on the planet! 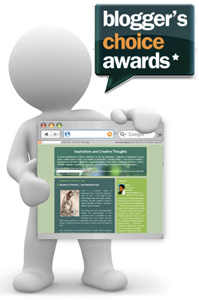 is now accepting nominations for the 2008 competition. Guess what! MysticSaint's blog Inspirations and Creative Thoughts has been accepted as nomination in the Best Religion Blog category! Congratulations to YOU for keep this space inspiring, light filled and creative. Blogger's Choice Awards asks all to sign up and vote for your favorite blogs to help determine the winners for next year. Thank you in advance for your vote and visit to the site. Your single but valuable vote can attract more readers to the blog and in doing so, you may partake in merits of sharing the inner truths common to whole of humanity and to share appreciation for all faiths and Divine spark - to more minds and hearts. Buddha's wisdom in Dhammapada reminds us not to underestimate that what is good. He says: "Do not underestimate good, thinking it will not affect you. even if one accumulates it little by little." Some Stats of MysticSaint | Everyday more than 45o unique visitors (and growing) means that on average every hour about 19 people across the world read this blog! Thats really a blessing. Monthly page view now reaches about 23 thousand (23,276 in March 2008) with unique visitors of 13 thousand (13,315 in March, 11,636 in February). Drops can really accumulate before we know! All praise be to the Divine One, the Real Doer of all.